No alignment with strategy. Our strategy establishes one set of goals; the compensation plan rewards other, often entirely opposing, activities. We're a full-service law firm for our clients, but we don't track or reward cross-selling. In fact, we create internal competition and ill-will by forcing partners to take a pay cut when they bring others into their relationships. We wish to expand into new practice areas and geographies, but we punish the partners brave enough to lead an expansion because their short-term economic contribution suffers. We want everyone to get out of the office and become a rainmaker, but we pay partners primarily to stay in the office and bill time. We promise clients seamless transitions when partners retire or depart, but we punish partners who introduce younger colleagues into key relationships by requiring them to split credit. We promote our client focus, but we pay for hours, not efficiency. Limited transparency. Some firms share compensation amounts among all equity partners. Others share nothing. Some firms have lengthy compensation plan documents. Others make all decisions in a closed-door session involving a select few. Some offer helpful scenarios to guide partner behavior in matters such as fee-splitting. Others trust partners to figure it out. What most miss is that transparency is not the same as having an open or closed system (sharing, respectively, all or no compensation details). Transparency is about establishing clear direction as to which behaviors we reward, and in what proportion, and doing so well in advance of the desired behavior. More than one managing partner has been shocked to discover that many, if not most, partners are unclear on the firm's primary compensation drivers. This is management shortcoming, not a result of dim bulb partners. Poor or insufficient metrics. Some financial metrics are easy to come by, such as billed hours or collected receipts. Others are more elusive, such as timekeeper or client profitability. Still other metrics are more directional in nature, such as cross-selling (we may know the client worked with another practice group, but we don't necessarily know whether the relationship partner drove that). Some behaviors have only subjective metrics: serving as a good mentor? community involvement? acting in the best interests of the firm? A solid plan has specific metrics tied to the desired behaviors, and a clear and sustainable methodology for measuring performance in more subjective areas. Inconsistent or incomplete reporting. When the compensation drivers are established, they should be published and then periodically the metrics tracking performance should also be published. Why not monthly? It serves little purpose to provide no metrics until year end, or provide vague or incomplete metrics at uncertain intervals during the year. It's hard make a course correction if we have neither a map of our destination nor our current coordinates. Failure to acknowledge self-interest. We all want to earn a healthy living. But just as partners are loath to discuss budgets with clients, many avoid compensation discussions until required to do so by executive or compensation committee fiat. There's nothing wrong with wanting to know what specifically I can do to increase my compensation -- especially if the management committee has aligned the comp plan to strategy, so maximizing compensation furthers the strategy! Also, far too often top rainmakers or management or comp committee members prevent meaningful discussions of compensation plan changes because they fear losing income. While a revised plan may indeed result in changes to some partners' compensation, if the outcome is improved financial performance for all (and improved client satisfaction), then it's bad form and quite possibly a breach of fiduciary duty for those at the top of the pay scale to refuse to review alternatives. 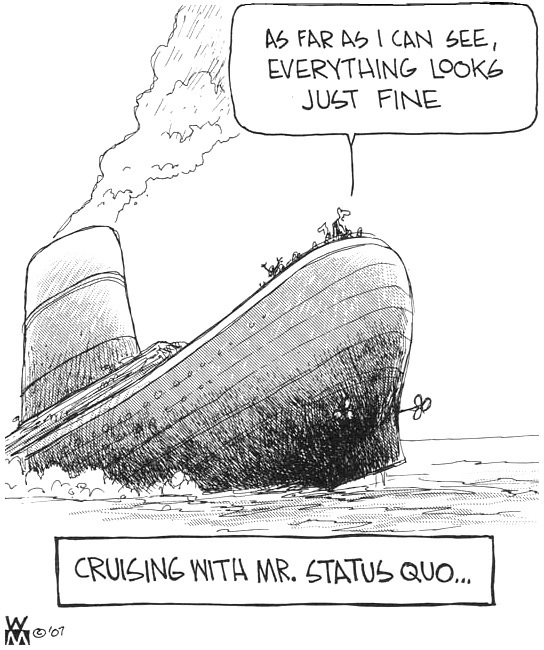 Pursuing a disruptive implementation. If we identify a better compensation approach that serves the partners' and the clients' interests, it's statistically improbable that everyone will make the same. The change may be good. Some partners who are more comfortable billing time might be quite pleased with a plan that offers more certainty but less potential. Rainmakers may enjoy growing their books of business without being tethered to the billable hour. But some change may be troubling: some may see a compensation decrease commensurate with a declining trend in economic contribution. But we don't have to make these changes all at once. We can establish the end-state and then migrate to it over several years, providing training or transition support to those who might be significantly disrupted by a new plan. Incomplete modeling. By nature, any forecast is speculative. To change a compensation plan means applying numerous "what if" scenarios to current performance, with no guarantee that we will sustain our current level of performance. We also don't know if, or how quickly, an adjustment to, say, origination credit will grow the pie. We don't know for sure how many partners will defect if their compensation will decrease, because the market dictates whether their economic contribution is more valuable elsewhere than here. They may already have the greenest grass they'll ever see. So we must model numerous factors, using realistic variables, and then create a few versions of the future. Failure to do this may result in significant disruption and unrest, and risk-averse lawyers tend to become flight risks during times of uncertainty. Big dog accommodations. Every firm has one, if not many, partners who are the top of the food chain and who are somewhat blasé or even outright hostile to firm policies. Nothing creates organizational turmoil than when senior leaders or big dogs are allowed to break rules that little people must follow. When a top rainmaker threatens to leave, sometimes the best response is to say goodbye. When new compensation policies are put in place, it may be reasonable to make certain accommodations for those who feed others. But there's a limit. The behavior we desire should be incorporated into the compensation plan, and there's no room for unwritten rules. A compensation assessment or redesign can be an extraordinarily effective tool to improve financial performance, foster a client-focused and collaborative culture, reduce unnecessary distractions, and provide a roadmap for career success. Expecting smart people to somehow "figure it out" is lazy management. Build the future you want in your law firm. Start today. Lately I've been spending a substantial amount of time working with law firm leaders on evaluating and redesigning -- yes, substantially rewriting -- partner compensation plans. 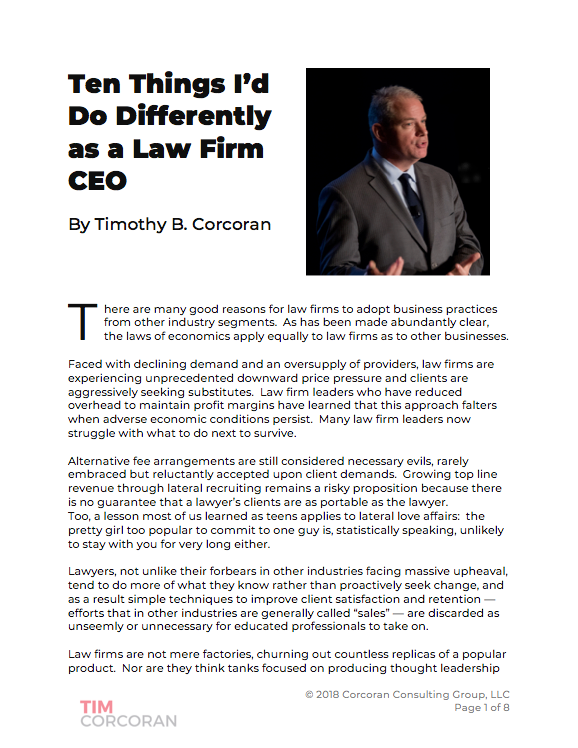 As with many other categories of the law firm business, for far too long law firms have operated as if practicing law relies on, and generates, human behavior that is not subject to ordinary rewards and incentives found elsewhere. Incentive compensation is an area of significant study in businesses everywhere, yet most law firms have ignored the available research and developed plans that are simultaneously simplistic (focusing on billable hours as the primary objective), complex (requiring significant manual compilation and exhausting negotiations), and ineffective (too few are specifically linked to the firm's strategic plan). I'll be writing much more on this topic in the days ahead as we unwind and reinvent law firm compensation. I'm interested in your views on law firm compensation plans, so feel free to share insights and observations below or connect with me offline. Your insights, whether I agree or not, may be included in future articles. For now, enjoy the recent conversation I had with Lee Pacchia of Mimesis Law WebTV as we discuss how self-generated distractions of poor compensation plans can impair law firm productivity. Bar Associations: Protecting Consumers or the Status Quo? In my role as sitting President of the Legal Marketing Association, and on behalf of our 3,600+ members, I collaborated with the leaders of other legal associations to draft a response urging the Texas Bar to reconsider its stance. These association leaders are well-credentialed professionals who are dedicated to improving the operations of law firms, big and small, and yes, improving the delivery of legal services. And one could argue that by specifically excluding such voices, the legal profession is holding itself back. You should read our letter. It's reasonable and articulate and provides good food for thought. Business clients are unhappy. Lawyers in the mid-size and big firms that serve us often do a terrible job of communicating. They fail to properly manage expectations by limiting the client's surprise. They tend to treat each matter as if it's unique and infinitely variable, yet at the same time expect us to believe their experience in a given field is meaningful. They believe in charging higher fees based on the length of time they've practiced, even when they are unable or unwilling to demonstrate this experience by using matter budgets or project plans. And their fees are typically established irrespective of the value I place on the services rendered, and what alternatives exist for me obtain these same services elsewhere, assuming that the seniority of the lawyer and the time necessary to deliver the work are the primary drivers of value. They claim that non-lawyers in a law firm, or worse, non-lawyers providing legal services outside the structure of a law firm, e.g., an LPO, must be incapable of providing quality legal services, even when these alternative providers can unassailably demonstrate higher quality at a lower cost. Does the Texas ruling really protect the consumer? There are different consumers of legal services. As a seasoned corporate executive, mindful of my corporation's risk tolerance and business objectives, and well-trained as a steward of my corporation's hard-earned capital, I don't need as much hand holding. I have long experience managing complex M&A transactions, launching new products requiring IP protection, managing layoffs and plant closures, negotiating labor contracts, and being deposed in contracts disputes. I want the Bar to protect me by ensuring my lawyers are competent in business issues. I can find a thousand lawyers who can conduct legal research, identify precedents, and draft a memo telling why taking some action carries risk. I find far fewer lawyers who think like me and understand the business impact of my legal issues. And if these so-called protections are not, in fact, in the interests of consumers, might they instead serve to protect the interests of lawyers? It's a curious industry that establishes its own operating rules, self-regulates its members' conduct, decides for itself what competition it will allow, and purposely addresses these issues without the input (or interference?) of anyone outside the profession. I'm not suggesting that there's a vast conspiracy with nefarious purposes, but I am suggesting that human nature operating within such a closed system is bound to create confusion between "what's right" and "what's right for us." From my perspective, the Texas Bar ruling has a lot to do with protecting lawyers from adopting modern, sound business practices, as if somehow doing so is inconsistent with practicing law. If a senior business person in a law firm can help the lawyer-leaders understand how to budget, how to profit from efficiency, how to embrace continuous improvement, how to lower fees while improving quality, how to better communicate with unhappy clients, and more, then not only should that businessperson be given a title befitting that knowledge, he or she should be given a compensation package commensurate with that experience, experience that is highly prized in the business arena. And if growing the firm's profits is a consequence of improving client satisfaction, then reward that businessperson in some way commensurate with his or her impact on business performance. If you're unable to distinguish between a non-lawyer who improves firm operations and client-focus, and one who is engaged in the unauthorized practice of law, I question your competence as a lawyer. If I can't trust you to understand simple business mechanics -- the issues I deal with all day, every day -- and if I can't trust you to recognize your own deficiencies and fill these gaps with competent professionals -- and instead you harangue those who speak truth to power and sit smugly in an alternate reality where partners cannot be wrong -- and if I can't trust your pals in the Bar to protect me from your deficiencies -- and instead they issue rulings designed to forbid competent professionals from meeting my needs -- then I can't possibly trust you to give me sound legal advice. THIS is why law firms are suffering, not because demand for legal services is down, or because bean counters value price over quality. By the way, let's banish the "non-lawyer" label as unnecessarily non-descriptive and non-productive, prone to nonsense. Defining something by what it's not isn't all that helpful, is it? Or keep it, if it makes lawyers feel better. No one really cares. But understand that corporate executives don't spend much time drawing such distinctions of pedigree and titles within their vendor organizations, so partners should feel free to proudly carry the label of "vendor" or "supplier." We care mostly about rising legal costs and declining value, not labels. Firm leaders who haven't received a single day of formal management training yet carry the label of practice group leader, or managing partner? Non-equity partners who are merely highly-compensated employees, not equity shareholders in a partnership? Can we look into Marketing Partners who have never taken a marketing course, Technology Partners who have no technology training, Finance Partners with no finance or accounting degree? Can we look into pitches and proposals that compile disparate experience in creative ways, purporting to reflect deep subject matter experience but instead reflect the common but misguided notion that "We're smart lawyers. If we win the work we can figure out how to do it later?" Can we look into lawyers' over-reliance on hourly billing rate cards to convey the price of legal services, when in fact rates are but one element of the formula for the overall cost? Can we look into published billing rates that reflect an inflated price as compared to actual receivables that perpetually reflect a much lower realized price? Can we look at inconsistent discounting and write-down policies in use in firms that bear no relation to "key client" programs? There's a lot wrong with the modern law firm business. It takes smart people with relevant experience to solve these problems. Forbidding competent professionals to lend their experience isn't productive. Insisting that a law degree is the only distinction necessary to decide what is and what is not "good" for clients is myopic. I call on the Texas Bar to review and revise its ruling to reflect the cold truth that protecting the status quo is not what clients want. Progress waits for no one, and the Bar Associations and incumbent leaders of the profession can wring their hands and lament the intrusion of economic forces, or they can collectively step up to reshape the profession. Relevance is recoverable. Roles as trusted strategic advisors are there for the taking. Your move, lawyers. Update: View my interview here with Lee Pacchia on the Business of Law webcast at Mimesis Law TV.